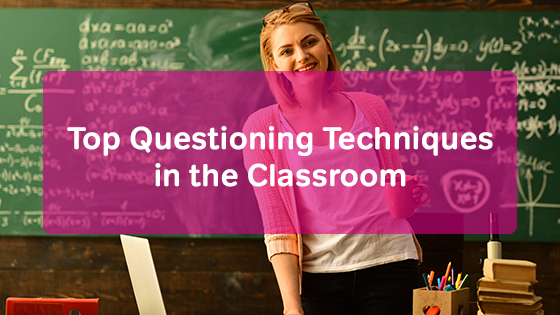 There are lots of reasons for using questioning techniques as one of your teaching strategies in the classroom. You could use questions to engage your students, check for understanding, test for comprehension, seek opinions, encourage creative and critical thinking, review information, or help students see other ways of thinking. The technique that you should use depends on the grade level, subject matter, and lesson objective. Here are some of the top questioning techniques in the classroom for your consideration. After posing a question to the class, give your students some time to think about the answer on their own. Then, have them turn to their neighbor to discuss the answer. They can talk through their ideas with their partner. Doing so helps students prepare their answer to share with the rest of the class. Do you have the same few students answering all of your questions? Rather than taking volunteers, write every students’ name on a Popsicle stick or card. Then, draw a name to determine who will answer the question. Doing so pushes all your students to think about their opinion or answer, so they can be better prepared to share their ideas. Choose one student to sit in front of the class. This student will answer several questions. You could ask the questions. Or, have other students pose them. If students are struggling to answer, allow them to “phone a friend” or ask someone in the class to help them. Think about Bloom’s Taxonomy: knowledge/recall, comprehension, application, analysis, synthesis, and evaluation. As you ask questions to the class, try to move from the most basic type of questions (recall) to more complicated ones (evaluation). By building on the complexity of your questions, your students will have an easier time building on the complexity of their answers, too. Split your class into several discussion groups. Have each group prepare a list of questions to ask the rest of the group. Students should take turns asking their questions. Then, the rest of the group can discuss their responses. Give each student a whiteboard to write their response to your question. The questions could be multiple-choice or true-false ones. Then, you can quickly check for students’ understanding of the subject matter. If you don’t have whiteboards, you could have students go to a different corner of the room or hold up a certain number of fingers. Scan the classroom to determine how everyone responds. Questioning techniques in the classroom are important to achieving lesson objectives. Vary the techniques you use to keep students engaged and providing the information that you need to meet their needs.